I have really become fond of my rescue horse Pablo Redcloud. He has become a trusted partner and a good friend, plus a fun ride. I’m glad I was able to adopt him, we are a good fit. Thank you Dan Matula and Melanie Hewett-Deaeth for allowing me to adopt him and give him a forever home. This story warms my heart and is a perfect expression of what Valentine’s Day is all about. We get the animals out of harms way but that’s only part of rescue. 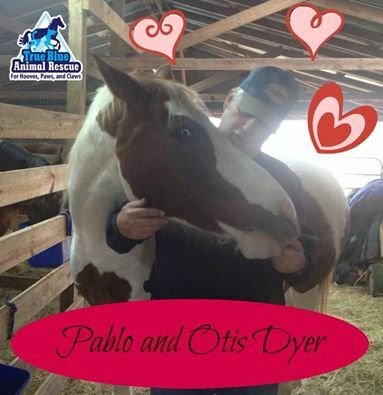 The true rescuer is the one who adopts and works through the difficulties a rescue animal might have and loves them unconditionally the way Otis loves Redcloud. Have a heart, adopt, don’t shop. We have lots of dogs, cats and horses that need homes. Go to www.t-bar.org if you want to help rescue an animal. Posted in Horse Success Stories, Throwback Thursday and tagged adopted, Horse, Success Story, TBAR, Texas, Throwback Thursday, True Blue Animal Rescue.